RE: Broadcasting live Spartan Chess comp-comp games Very nice! The crowned rook is an improved, I think, chess-generalized representation for the General. The banner artwork, 'Thermopilae Marathon' is very appropriate depicting the spear-equipped Spartans, bathed in arrows, facing the Persian infantry. From your description: 'The Spartans start with two Kings, and lose when they leave all their Kings in check.' What a succinct and accurate way to say this. Wish I had thought of it. I am going to have to incorporate this into the next version of the rules :) If I understand what is going on Fairy-Max is playing Spartan and ChessV is playing Persian and Fairy-Max is winning, vary roughly, 2 games to 1. If this understanding is correct I imagine that you will be reversing sides at some point, having Fairy-Max playing the Spartans? I did some 4-men tablebase calculations to confirm what I already suspected: K+W or K+G each beat both K+B and K+N. K+R vs K+C is usually draw. K+K can draw K+Q, if the two Kings can connect before the Queen can fork them. I will do some 5-men later. I am broadcasting live Spartan Chess comp-comp games now at http://80.100.28.169/spartan/spartan.html Currently ChessV is playing blitz games against Fairy-Max there. Some other engines are in the making. The idea is to have a tournament once they are finished and tested. I understand your aim, but I wonder if the Spartan piece design you presented here can achieve it. It will be very hard to break people's preconception that you are playing normal Chess. They will always try to map whatever pieces you have on orthodox pieces, no matter how strange they are. If you have many of them they will assume they are normal Pawns, even if they were as different from Staunton Pawns as draughts chips. I would expect it to work better when you would put a sign explaining the Spartan pieces next to the board (with pictures of them,and how they move), below the text 'Spartan Pieces' in large lettering. (There is no need to fully explain the rules; the only purpose is tomake it clear at a glance that pieces are involved that move differently.) Then they will realize it is a variant before they actually look at the board position, as the sign attracts more attention. I think that should prevent them from feeling tricked. Of course the majority of Chess players will still pull down a curtain in front of their face as soon as they are realizing they are looking at a variant, so they might never take a look at the board at all. But it is pointless to target this group anyway. HG ... Your set looks great. The crests on the four finished hoplites on the left make me smile. This crafting is something I am not cut out for or I might have made my own set. Nice work! I have departed from the universal pieces approach to designing the Spartan pieces due to some practical experience I have had. There is a lot to be said for this approach and it's certainly what I am now using when playing face-to-face. I use pieces from a Capablanca set for the Spartans and thus use the Archbishop for the Warlord and either the Queen or Chancellor for the General depending on the preferences of who is playing. We play most weeks on Saturday night at a Game store here in San Diego. The game is set up at the front counter so there are quite a few folks that walk by and look. These people assume its orthodox chess and with a few of the right pieces removed there would be no way to tell that we were playing something different. There is quite a bit of confusion and for many this confusion is a turn-off. When they have looked at the game for several minutes and asked a question like, for example, Why is the black King still in check? The first thing I must explain is that we are not playing orthodox chess. That takes some doing and often starts the whole conversation off on the wrong foot. It seems to me they feel betrayed or ignorant but I am not sure. What I do know is that the reaction is not positive. So for the masses that would not know an Archbishop or a Chancellor if they saw them, one of my design goals is at-a-glance clarity and the clarity I am want is this: I want anyone who walks up and glances at the board to realize its not orthodox chess no matter how many pieces there are on the board. Hence I have departed from universality and there is a downside to this but it is, for me, a trade off. I suppose it's of a marketing decision of a sort rather than a chess decision. So, are you planning on playing against someone with your new Spartan Chess set? The similarity with your design is that I also use a ridge on the helmet of some of the Spartan pieces. The design philosophy is based on universality of pieces amongst variants, however. So the King, being a orthodox FIDE King, is represented by an ordinary Staunton King. Similaly, the Warlord, having the same moves as the Archbishop of Capablanca Chess, uses the Staunton representation for this piece that has become more or less standard. Arcbishops and Kings crowned with a cross might not fit very well with the context of Sparta, but neither do Bishops or crosses fit with the Persians. And I certainly did not want to make new representations for familiar pieces. So I decided to ignore such historic friction. Naming the pieces different is OK, but i want them tolook as famliar as possible. For this reason I represented the General as a Rook with a King's cross, as it is, after all, a 'Crowned Rook'. The Lieutenants move Bishop-like (mostly diagonally), and the Captains Rook-like (orthogonally), so I have given them representations in which the Rook and Bishop are still recognozable. The rook has acquired a roof (for which I used the top of a Staunton Bishop) to distingush Captain from orthodox Rook, and the clipped bishop was 'Spartanized' by putting a ridge on its head, like was done to convert Pawns to Hoplites. H.G. I am very interested in seeing what you come up with in the way of a Spartan Chess set. 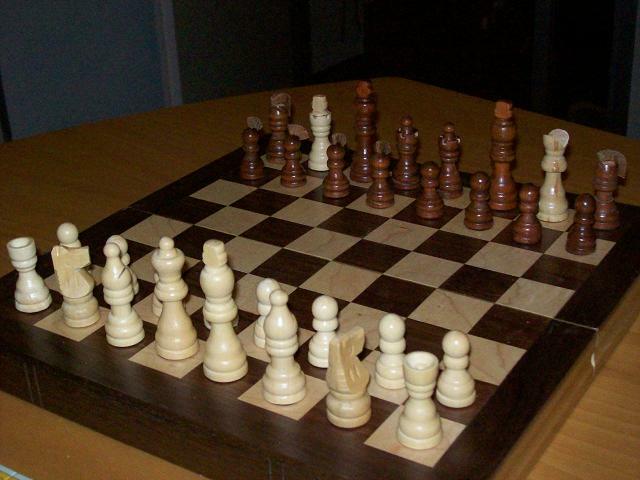 I have bought two (cheap) identical wooden chess sets, with the intension to convert it to a Spartan Chess set. What I had in mind looks a bit like what you propose here, with a few small differences. From my studies I have posted an article on Spartan government on the Spartan Chess web site. Here is a portion of the article. You may view the complete article here: Spartan Government. A man argued that Sparta should set up a democracy. --Begin with your own family. Spartan government is the strangest I've studied. It had elements of monarchy, aristocracy, oligarchy, democracy, a republic and the 1950s TV game show 'Queen for a Day'. It has, nevertheless been among the most stable and long lived governments the world has ever known. Sparta had two Kings, a 'dynarchy' for you linguists. The point of having two Kings was stability. Two Kings prevented problems that so often arose in monarchies when 'the only' King died, anarchy ensued and a civil war was held to determine the next King. Spartan Kings ascended to the thrown from two Royal families, the Agid and Eurypantid. These families were not allowed to intermarry and could have been the stuff of a Spartan Romeo and Juliet story if there had been romance and literature in Sparta. The Kings held military, political, and religious power. They led and trained the army (sort of) held seats on the Council (an otherwise elected and legislative body) and performed various religious and ceremonial duties. I imagine the ceremonial duties were ones akin to presiding over a contemporary 'arbor day ceremony,' but one where some poor small animal was slaughtered and its entrails examined. Despite having a Monarchy, Spartan politics was, as you will see, dominated by bureaucracy. When things became just too deliberative, too mired in political red tape, about the only thing a King could to do unilaterally and by decree was assemble his 300 man bodyguard and march off to places like Thermopylae and then, very gloriously, die. Spartan Kings were not very powerful, sort of like today's Queen of England. View the rest of the article here: Spartan Government. For those who have asked about a traditional chess set to play Spartan Chess the Spartan pieces are in development and I am estimating the pieces will be available in a couple of months. I am planning on making the pieces available through a outfit like http://www.shapeways.com/.